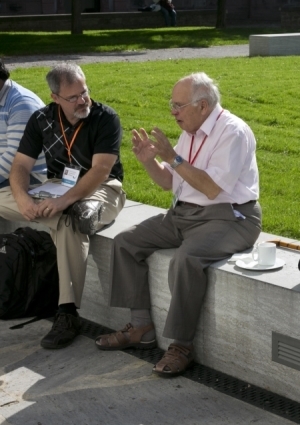 Sir Michael Atiyah is known for is expository writing and speaking as well as his profound contributions to mathematics. The following is an excerpt from my conversation with Atiyah discussing his views on mathematical exposition. MA: I have strong views on that. Too many people write papers that are very abstract and at the end they may give some examples. It should be the other way around. You should start with understanding the interesting examples and build up to explain what the general phenomena are. This way you progress from initial understanding to more understanding. This is both for expository purposes and for mathematical purposes. It should always guide you. When someone tells me a general theorem I say that I want an example that is both simple and significant. It’s very easy to give simple examples that are not very interesting or interesting examples that are very difficult. If there isn’t a simple, interesting case, forget it. Mathematics is built on abstractions. On the other hand, we have to have concrete realizations of them. Your brain has to operate on two levels. It has to have abstract hierarchies, but it also has to have concrete steps you can put your feet on. Everything useful in mathematics has been devised for a purpose. Even if you don’t know it, the guy who did it first, he knew what he was doing. Without knowing the examples, the whole thing is pointless. It is a mistake to focus on the techniques without constantly, not only at the beginning, knowing what the good examples are, where they came from, why they’re done. The abstractions and the examples have to go hand in hand. You can’t just do particularity either. You can’t just pile one theorem on top of another and call it mathematics. You have to have some architecture, some structure. Poincaré said science is not just a collection of facts any more than a house is a collection of bricks. You have to put it together the right way. You can’t just list 101 theorems and say this is mathematics. That is not mathematics. That is categorization. Mathematics is not a dictionary. JC: I think people are more willing to give these examples verbally than in print. MA: You’re quite right. It is kind of a reaction in recent times. People began to go beyond what they could prove and got a bit woolly and they got a bad reputation, like some of the Italian algebraic geometers. So you are taught to be rigorous, and you learn to be very, very rigorous. And then you think that your papers have to be ultra-rigorous, otherwise the guys behind you will find fault with what you’re saying. The need for rigor, it’s a bit like the people who are afraid of being sued by the lawyers. If you don’t put it down, 100%, someone will sue you! People cover themselves in advance, but the result is an unreadable paper. But when you talk like we are, you’re allowed to lower the level of rigor in order to increase the power of explanation. You can explain things using hand waving, use analogies, leaving out technical details, because you want to get the idea across. But when people write, particularly mathematics, and particularly in the last decades of the last century, people became very formalistic. Papers were reject if they were not rigorous enough. People were reacting to the loose talk of the past. So we went to the other extreme. And most papers aren’t read. Someone said the average number of readers of a paper is one, and that’s the author. JC: And with multiple authors, maybe it’s a fraction. MA: That’s right. I used to tell people, make your introduction understandable to a general mathematician. Don’t get into the technicalities there. Say you’ll deal with them later. Don’t just say “Let X be a space” and jump into the details but that’s what people do. So you’re right. But people know when they give a lecture to behave differently, they can use all the tools of hand-waving, literally! [waves hands], to get idea across. Some people write so well it’s as good as a lecture. Hermann Weyl is my great model. He used to write beautiful literature. Reading it was a joy because he put a lot of thought into it. Hermann Weyl wrote a book called The Classical Groups, very famous book, and at the same time a book appeared by Chevalley called Lie Groups. Chevalley’s book was compact, all the theorems are there, very precise, Bourbaki-style definitions. If you want to learn about it, it’s all there. Hermann Weyl’s book was the other way around. It is discursive, expansive, it’s a bigger book, it tells you much more than need to know. It’s the kind of book you read ten times. Chevalley’s book you read once. You go back to these other books. They’re full of throw-away lines, insights that are not fully relevant for going from A to B. He’s trying to give you a vision for C. Not many people write like that. He was an exception. Find a further version of this interview on John D. Cook’s blog. Thank you for posting this, it really resonates with my own experience and gave me a renewed desire to write better, more expository papers.